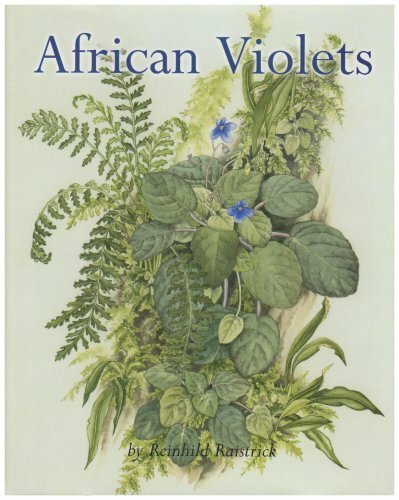 "African Violets: In Search of the Wild Violets"- a unique book of botanical paintings of all known wild African violets written and illustrated by Reinhild Raistrick. Tel: 01284 787372 or email (click here). A monograph on the genus Saintpaulia which contains a unique record of all known African Violet species. A memoir by a botanical artist who returned to her roots as a ‘child of the forest’ in Tanzania, to record in illustration form this endangered species. Detailed line drawings to assist identification. A beautiful book showing clearly the origins of one of the world’s most important plants in the nursery trade. A book highlighting the effects of de-forestation, global warming and the need to conserve our heritage. Reinhild Raistrick lived in the Usambara Rain Forest, Tanzania for most of the first 25 years of her life. She grew up with a love and detailed knowledge of the forest flowers, and speaks fluent ‘Kishambaa’ - the local tribal language rarely mastered by Europeans. In 1990, she returned to the Usambara Forest, and spent two years painting flowers of the region. This book is the culmination of 20 years work in tracking down and painting this unique record of all known African Violet species. Working closely with the Royal Botanic Gardens, Kew, this book contains the only collection of its kind, and captures in beautiful and scientific form some of the rarest and most endangered African violet species. Behind the paintings is captured an extraordinary personal tale of the artist’s childhood growing up in Africa, the grand-daughter of one of the first missionaries and slave-liberators in Tanzania. In addition, many of the illustrations in the book are accompanied by anecdotes relating to incidents which occurred when painting the wild flowers in situ. The book tells a fascinating story of how an individual – with a deep passion for the flowers of the rain forest – persevered over many years to compile this beautiful and unique record of the complete known species of the Saintpaulia. Illustration: 52 full colour plate botanical paintings, 16 photographs and 1 coloured map showing African violets sites in Kenya and Tanzania.